After reading Joshua Partlow , Nick Miroff and David A. Fahrenthold Washington Post story on the pipeline of illegal Costa Ricans working at various Trump Organization properties for years, it’s easy to see how this will put pressure on the golf industry to either suggest this is a one-off situation, or adopt E-Verify. Many of the immigrants interviewed worked on the construction of Trump Bedminster, home of the 2022 PGA Championship. While Mr. Trump now villifies such illegals, the company has adopted the E-Verify system at select properties. Of 12 Trump golf courses in the United States, three of them — in North Carolina, Southern California, and Doral, Fla. — are enrolled in the E-Verify system, according to a federal database. Eric Trump said that “a few” other clubs, including a Trump course in the Bronx, use a private vendor to screen new applicants. The Post story noted that competitors in the industry more consistently rely on E-Verify. But shouldn’t the golf industry, presumably supportive of this policy, proactively push for industry-wide use of the program? Oh right, they like cheap labor more. Scratch that thought! 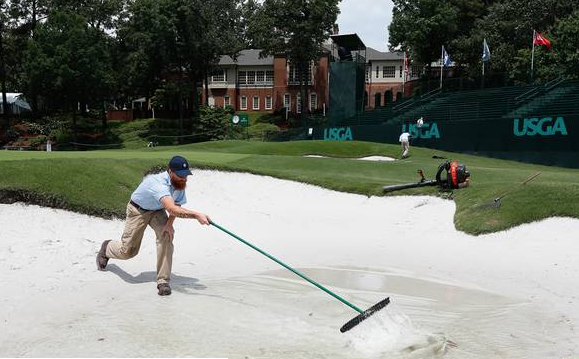 As Ariya Jutanagarn is positioned for a likely U.S. Women's Open victory (Beth Ann Nichols with a great read at Golfweek.com), it's the grounds crew that has kept the place playable despite absurdly unfair circumstances. Writing for USGA.org, Julie Williams highlights the work of Shoal Creek's Rex Davis and crew. The week could have played out very differently. Davis noted that 15 days before the championship, Shoal Creek was playing firm and fast. The greater Birmingham area had seen limited rainfall. New greens went in at Shoal Creek in the fall of 2016. Given the moisture, they haven’t been as fast as Davis would have liked, but the drainage has helped to keep the championship close to schedule. Shoal Creek’s new greens drain at a rate that is four times faster than the old greens. As Davis eyed the approach of subtropical storm Alberto, he started making preparations. Shoal Creek staff mowed the fairways seven times and the rough three times in the week before the championship, also applying growth regulators to the grass. Knowing the golf course might take on large amounts of rainfall, Davis had crews clearing pine straw and other ground cover from every place they anticipated that water would run through the property. I've always been particularly fascinated at the idea of minimalist course designs costing more to maintain. The concept is generally perpetrated by the tin siding-salesman masquerading as golf architects who sometimes plaid jackets and would just as soon be selling you a policy as they would be in designing interesting, affordable golf holes. They also don't really like the minimalist movement for a variety of reasons, from general point missing to just wanting to sell projects on goods and services they don't need. Born out of this have been derogatory whisper campaigns about the perils of going minimalist, including the contradictory notion that bunkers maintained as rough hazards take more time and money to present than those edged weekly and raked daily. So as accustomed to this completely bizarre take as we subscribers to the movement have become, it was a bit disheartening to read Gary Van Sickle's MorningRead.com take suggesting AT&T Byron Nelson Classic host site Trinity Forest was an example of the kind of "high-maintenance, slow-play golf course" the game needs less of. Golf needs low-maintenance, fast-play golf courses. Trinity Forest is a high-maintenance, slow-play golf course. Did you see some of those massive bunkers? An amateur could spend five minutes raking his or her way out of the trap. Greens are the most expensive parts of a golf course to maintain, and Trinity Forest has gigantic greens. One double green is 35,000 square feet. Pebble Beach’s front-nine greens would almost fit in that corral. It’s ironic that Trinity Forest seemed like a breath of fresh air with its different look and myriad challenges, but it is not an economically viable model for golf in most areas. Despite the deep pockets of the members, the maintenance approach is pretty restrained. Reviewing my notes from an interview with superintendent Kasey Kauff, he noted Trinity's full staff for the course is a very normal 24, including assistants and technicians. Fairways are cut twice a week while bunkers are raked at the same rate (with touch ups). The greens are mown just five days a week in peak season, once or twice a week in the winter. Thanks to the slow-growing zoysia and lean watering program, bunkers are rarely edged. Fertilization is at half the rate of a Bermuda grass golf course. Half. As for slow play, maintenance and design are not to blame for threesomes in a full field PGA Tour event not getting around in a timely manner. When today's players can reach all par-5s in two and at least one par-4 in one, that's a distance discussion and sometimes a green speed discussion. Trinity Forest's greens were at a modest 10.5 on the Stimpmeter. Yes, Trinity Forest is a wealthy membership with a token First Tee facility and it took millions to convert a landfill into a course only a select few rich guys can join. Quibble with that stuff all day long if you must. But suggesting the design is an example of high-cost maintenance and slow play maintenance would not be accurate. I'm not sure what year this is from but the piece was just posted on the Masters YouTube channel. I know I've seen snippets of this footage before, but it's still fun to see how much goes on before the Masters gates open at 8 am. While this is a shock to almost no one, we've never had solid statistical evidence that the chase for faster greens slows down play. Anyone who has some of the best putters on the planet mark 18 inch putts when greens are pushing 14 realizes speed forces caution for even the very best. An increase of one foot in Stimpmeter reading resulted in an increase of 6.39 seconds per green per player. This one foot increase equates to an increase in total round time of a foursome of 7.67 minutes. 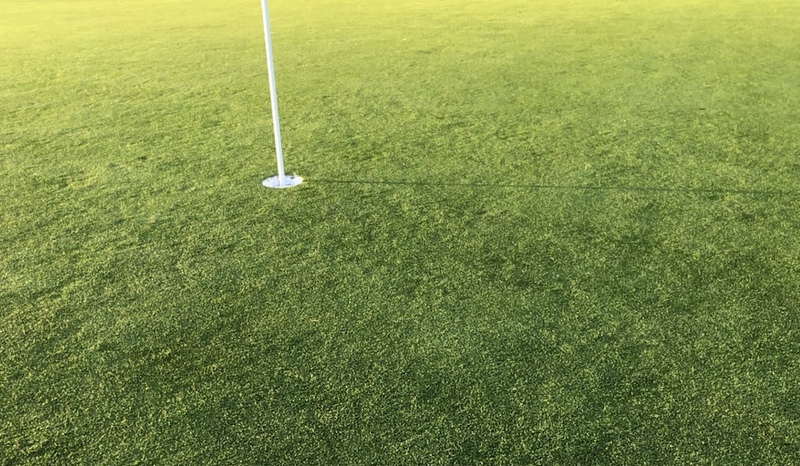 In some instances, the increase in time spent per player per green resulted in an increase of as much as 30 minutes per round for a one foot increase in green speed (25 seconds per player per green). Overall, playing experience ratings decreased as green speeds increased. This decrease, although statistically significant, was small. In conclusion, we found that faster greens equate to longer round times. The strength of this relationship, however, is not as substantial as we had hypothesized. Perhaps I'm misunderstanding, but I would disagree that the number is insignificant. On these findings of one foot of speed increase, greens Stimping 9 for a foursome would take 76 seconds less to play a hole than a group dealing with 12 on the Stimpmeter. Over the course of 18 holes that adds up to over 20 minutes. Throw in the added cost, stress and architectural impact, all of which do not improve the game, and the chase for speed continues to make little sense. For anyone hosting a major or thinking of doing so, Tony Dear's Links piece is worth a read given the high-profile Chambers Bay experiment. As the story notes, it succeeded on the financial and ratings front, but agronomically left a scar that is now being rectified by a creative conversion to poa greens. According to its Annual Report, USGA revenue from its Open championships (U.S. Open, U.S. Senior Open, U.S. Women’s Open) in 2016, when the U.S. Open was played at Oakmont, was $53.3m. In 2015, it was $64.3m. The irony in all of this is that Chambers would make a great PGA Championship venue...in August. May? Not so much. Though still certainly doable and capable of bringing big energy and bigger West Coast ratings. A few years ago a post here noted the USGA Stimpmeter offer at USGA.org and while it was surreal then, to see the organization pushing the $110 devices in emails to their members. Including "For The Good Of The Game" branding on the devices seems almost April Fools worthy. Especially given how we know green speed is dangerous to turf health, pace of play and architectural character, all things we know because of USGA research and experience! Some in the superintendent community, who will have to deal with members perhaps buying the devices, were not pleased. The golf industry convened in Orlando last week to compare notes, take in seminars, talk turf and debate who reports to the more insane membership. As we have the last few years, field producer extraordinaire Donny Goertz and I roamed the floor hoping to stumble on some fun stuff and this year may have been the best set of innovative products yet. We talked with GCSAA CEO Rhett Evans about the state of the industry. We took in the insane construction job supervised by the Golf Course Builders that created an undulating area for mower testing and real bunkers showcasing products. One of those products was recycled soccer field artificial turf now being used for sodwall bunker stacking, changing a bunker face lifespan from 5 years to 20 or more. We saw an amazing Pixar-like company that can simulate what your renovated or new course would look like and now is adding VR to the equation as well. Amazing! We talked to the founder of New Ground Technology, Pete Davis, who explained the designs you've seen in outfields around Major League Baseball and how you can expect to start seeing them on golf courses. With, of course, some imaginative steps taken by tours and sponsors to more cleverly plant sponsorship onto turf in a responsible way. John Green of the Hutchinson News reports on Crazy Horse Sport Club and Golf Course turning their native roughs over to three goats who will eat any weed, including poison ivy. Jon Mollhagen, the Lorraine rancher and businessman who bought the course earlier this year, obtained the three female animals from a friend, said Seitz, who did not know their breed. Of course it's not actually news, but the way many links once had their roughs maintained. In fact, quite a few could borrow the Crazy Horse practices and maybe give us healthier natives while saving a few balls. One of the best military base golf courses in the country is another casualty of California's drought and rising water prices. Dave Alley of KEYT files a full report from the nearly 60-year-old course. "It's the price of water," said Col. John Moss, 30th Space Wing Commander. "The price of water and what it requires to water the course has just gotten to the point where it's prohibitive for us to be able to afford that. This year alone would have cost us several hundred thousand dollars to water the course and it's just money we don't have." The course, which opened to public play in 2005, has been sustained by non-appropriated funds during that time span. However, escalating water costs has made operating the course financially unsustainable. As the price of water has risen steadily over they years, the base has had to tap into MWR funds to cover costs. "We are taking immediate action to ensure we are good stewards of our funds," said Josie Cordova, 30th Force Support Squadron (FSS) deputy director. "When the MWR Fund is in danger of bankruptcy, that threat includes potential closure of our other base support functions." To help cut costs, the course implemented a series of measures over the past several years to conserve water, including installing more efficient water infrastructure. "We stopped watering the middle of the fairways and reduced the amount of water we were putting in the course overall and ultimately we're at the point we're at now and we were only watering the greens and the tee boxes and even that wasn't enough," said Col. Moss. I've played the course many years ago and saw it again in recent years and it's a gem on great terrain. Really a shame. 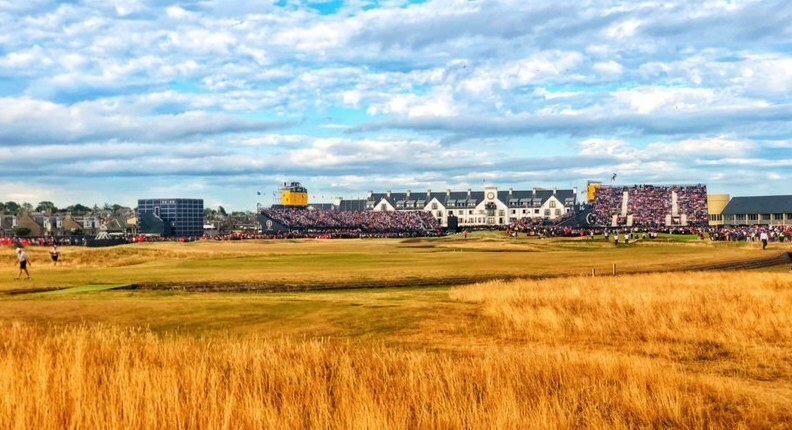 Dave Shedloski talked to a few players after Saturday's Open Championship third round when the R&A decided not to mow greens, leaving them at 9.5 on the Stimpmeter. Players were notified by text of the speed figure and plan to not mow. First, we should commend the R&A for taking the cautious approach, learning from last year's St. Andrews no-play day fiasco. Woohoo! The bigger question involves speed and the belief that faster surfaces are a greater test of skill. We know that speed is used to protect courses and certainly a reading of 14 will make players defensive. And slower to get around. Saturday at Troon the scoring average was 73.370 and yet, twosomes got around in 3:30 generally because every 2 footer did not need to be marked. Two players lead who are not known for their ability to make a lot of putts of late, yet they seem to be putting well. But you also don't sense there is an overemphasis on putting. Yet this was an interesting take from the various comments Shedloski reports. “If they were 10, you wouldn’t have to think about it [the pace]. You would be surprised,” he said. Or, is it? After all, it's a putting stroke and act of skill to stroke it in a solid way that gets it to the hole, no? Isn't that a more skillful act than merely starting it on a line? "Oakmont incident inevitable as ruling bodies let golf fly out of control"
Players Saturday: Two Hole Locations Changed, Apologies Shared, Move On? If you didn't see any of the coverage or believe me from my post yesterday that the PGA Tour rules staff genuinely didn't try to push TPC Sawgrass over the edge, note from Rex Hoggard's report that they changed two Sunday hole locations and expressed their regret. PGA Tour VP Mark Russell appeared on both Morning Drive with Damon Hack and Todd Lewis on Live From to explain how sickened they were to lose control of the course. I'm not sure many will believe him given the sense that scoring drove the changes. I certainly understand given my view that the overall push for green speeds is an intentional or subliminal movement in golf to combat the overmatched nature of courses. While I never enjoy seeing a course setup go bad--especially when I know how sick the PGA Tour rules staffers and weather forecasters will be following Saturday's TPC Sawgrass putting bloodbath--it's good to have days like this to remind people how close golf courses are taken to the edge in the name of resisting technological advances that no architecture can keep up with. When Stimpmeter speeds hover in the 12-13 neighborhood, the slightest bit of drop in humidity mixed with little root structure and unexpected wind can send greens that just days before were said to be too soft (but still wickedly fast) into a state of goofiness. We reached a point in the sport where the green is taken up to extreme speeds and allowed to play too prominent of a role at all levels in part because agronomists are so good at what they do. But mostly, it's about, but the professional game having outgrown just about every course on the planet. As the 2016 Players joined the list of tournaments influenced by a setup gone wild, we are reminded again that the modern golf ball, when hit by the world's best, goes distances not foreseen by designers and therefore is not something manageable by any design under 8000 yards. The TPC Sawgrass, once a beast, is often overmatched in today's game. It's final defense, short of 5 inch rough and and adding new tees: extreme green speeds that are manageable until they're not. Unlike every other professional sports league, the PGA Tour will never get in the business of regulating the equipment played at its events to keep courses relevant and green speeds at a sane level. So there is sweet irony in watching yet another position taken with profit margins in mind bubble to the surface at the Tour's marquee event. The unfortunate takeaway most will have from Saturday's debacle will believe that the tour was angry at the low scoring and did this. But having been around the TPC all week, I didn't encounter one PGA Tour official even the least bit bothered by Jason Day breaking the 36-hole scoring record. This was a greater-than expected change in the weather that took greens so precariously close to the speed edge and turned them silly. It's funny that a sport which self congratulates itself repeatedly for having more integrity than any other looks the other way when it comes to protecting the integrity of its playing fields, solely in fear of (potentially) costly regulatory fights that also might call into question golf's devotion to the gospel of unfettered capitalism. How is this sad state of affairs any less ridiculous than looking the other way on a doping scandal? Over the first two days, there were 122 combined three-putts among the 144 players in the field. On Saturday there were 149 three-putts among the 76 players who made the cut, and 15 of those players had at least 34 putts for their round including McIlroy, who had 37. Rex Hoggard has some eye-opening putting stats as well, and has this from PGA Tour VP of rules and competitions Mark Russell. But then that doesn’t explain a three-putt percentage of historic proportions? The Tour average for three-putts in a round is 2.93 percent, and on Thursday and Friday the field hovered around the norm with a 2.08 and 2.67 percent average, respectively. On Saturday that number skyrocketed to 11 percent. Rory McIlroy had one of the worst days on the green, reports Will Gray at GolfChannel.com. McIlroy opened his round with a birdie, but he realized conditions had changed when his 85-foot eagle attempt on No. 2 raced nearly 18 feet past the hole. It led to the first of five three-putts on the day, including three such instances in a four-hole stretch on Nos. 10-13 that dropped him off the first page of the leaderboard. Jim McCabe says the Shinnecock word came up a lot after the round. And when his back-nine 42 and round of 79 was complete, Ian Poulter blurted out “TPC Shinnecock,” only to catch himself and shake his head. “I’ll refrain from saying anything,” Poulter declared, and wisely he moved to the autograph area and signed for a long line of youngsters. ESPN.com's Bob Harig says players were not buying the tour's stance on greens getting the same treatment as the previous days. Technically that is true with one extra rolling between the conclusion of round two and the start of round three. "It was a massive change -- it wasn't very subtle,'' Scott said. "That was borderline unfair on a few holes,'' Rory McIlroy said. "I felt like I was putting on dance floors out there,'' Billy Horschel said. "It was crazy tough,'' Matsuyama said. There were just three rounds Saturday in the 60s and only six under par. There were seven in the 80s. The 76 players in the field combined for 149 three-putts or worse -- a record for the course. There were 86 double-bogeys or worse.